On 10 acres of grassland in Arizona's Prescott Valley, a herd of Huacaya alpacas peacefully graze and frolic in the sun. Brian and Valerie, the owners at Plum Creek Alpacas, preside over this pastoral scene, giving these fluffy animals their undivided love and one-on-one attention. Visitors to their farm can share in this tranquil experience as they run their fingers through the animals' silky fiber and observe them playing and socializing with each other. Visitors are welcome to snap pictures and purchase their own piece of alpaca fiber to be saved as a keepsake or turned into a warm pair of winter socks. Join us for an educational tour, from the livestock guard dogs to the alpacas, chickens, ducks, and turkeys. 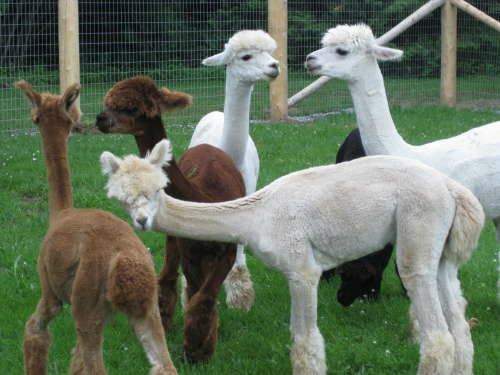 You will be able to feed some alpacas and they will try to catch a mom and cria (baby) for you to touch and feel. At the end of the tour, visit the gift store featuring products produced with Alpaca wool. The tour will start promptly at 10:30 am so plan to arrive early for sign-in. It is about an hour and ½ drive on the I17 from I10. After the tour, join us for lunch at The Cooper Pit located 5 miles S of Plum Creek Alpacas. Address will be supplied with registration/payment.